What caused me to blow off the dust? - A friend on twitter commented recently she was listening to a song from this record. It has been a very very long time. Overview - Formed in New York City in 1990 from the ashes of the band "Gorilla Biscuits" the post hard-core band Quicksand would go on to release two full length studio albums. Manic Compression would be the 2nd and final full length. The band would garner some attention with like minded and sounding bands in the early 90's before disbanding in 1995. FDF Comments (aka the songs) - The album opens with "Backward" a very short track that sets the tone right away. The bass and guitars have a punch to them while the drums clip over. The vocals are a little gruff, but they suit the vibe of the bands sound. There is hardly a break and "Delusional" begins. The bass chugs along with the drums as the guitars do a certain repeated fill over them. The vocals are slow and the track keeps a basic tempo "Divorce" returns to the feel of the lead off track. Quick driving and pounding bass and drums with the guitar filling in big riffs as they'd get towards the chorus. The band up to this point focus on the group vibe vs. any single player really "showing off". "Simpleton" has a stark tempo change relying more on the percussive side of the drums with the bass working in tandem. The guitars would get the push with some good size distortion on them and it is calm vocally but musically it hits pretty hard. The guitars also get the first, what feels like, solo on a song. There is a drum line breakdown before the band loops back around. Vega gets to show off during the intro of "Skinny (It's Overflowing)". Granted the bass line is not overly complicated but he is the primary instrument and Cage joins him before the vocals and guitar come buzzing in. It then hits down and gets even tighter as the song progresses. It repeats back to the bass riff and we do it all over again. The biggest song from the album and perhaps the band come in "Thorn in My Side". This is/was the perfect track to release as a single. The band utilizes some time signature changes and vocal changes for a great effect. It slowly builds to just a chaotic explosion at the end and when Schreifels counts "1-2-3-4" and the band comes slamming back in with him, you get it. You just get it. A lone guitar starts off "Landmine Spring" but before you know it we lock back in to a deep groove with thunder drums and chugging bass. The band has some very "Tool-like" moments as well with the time signatures and bass work. The only bummer to the song is the fade out, it could have had a thunderous ending. "Blister" opens back to the hard-core emotion found earlier on the record. You can mentally see the band really throwing themselves in to this track in a live setting. "Brown Gargantuan" complements the prior track with much of the same overall vibe. This track there is more of a guitar solo, as well as verse/chorus/verse set up. The end of the track is sort of odd in that a single guitar plays odd runs of single notes while a second drones over it. You almost think its the start of the next song, but its the end of this on. "East 3rd St." comes raging back in with the big wall of sound that makes the record so strong musically. If you like the genre, these are some real cornerstone tracks using the formula, melody and over all ferocity as well. A stand out track. "Supergenius" keeps up the hard vibe of the record with its wall of guitar and drums. The album closes with the 6+ minute track "It Would Be Cooler If You Did". The drums get the old "rat a tat" roll at the start with some guitar chords and bass under the hushed vocals. It starts to build up after 3 minutes with everyone getting a little more fired up. It feels like it could really get going, but the band decides to go with the feedback, loops to for a bit, before the drum clicks back in, but it doesn't really come back the way you'd want it to. Still, a decent album closer. Where are they now? - The band broke up in 1995 and then reformed for a short burst 97-98. After a tour with the Deftones the band tried to work on a follow up but it proved to be too much on the guys. Cage kept busy in Seaweed and Enemy. Vega played bass on tour with the Deftones as recently as 2009. (We looked at "Around the Fur" on FDF, you can read about it here. He works on solo projects and also DJs in and around New York City. Capone formed the band Handsome after the split and Schreifels formed Rival Schools and has worked on solo projects with his first slated to be released in April of 2010. FDF Personal Comments (aka the Live experience) - I did see the band live one time. May 29, 1995 at the Roxy in Boston as part of a local radio stations concert series. It was great because Orange 9MM was on the bill as well which made it a great night for me personally. FDF Overall Take - Listening again some 15 years later it can feel a little date, or almost campy to some. The band has the chops and the emotion in their music, and perhaps their lack of larger success makes them more tolerable to many. Still there are some great moments on the record and is a good example of a post hard-core band from this, or any era. A myspace page here, as well as a site for Walter here. Tracks taken from "Manic Compression" which is not too easy to find, but you can start here. cool. thanks for the intro to this band. 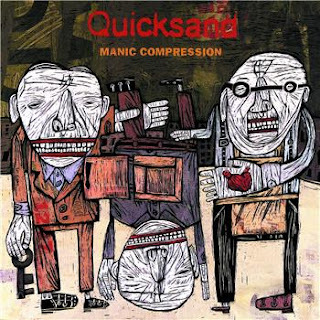 Check out the Dig Me Out Podcast for a review of Quicksand's 'Manic Compression' at digmeoutpodcast.com, a weekly podcast dedicated to reviewing lost and forgotten rock of the '90s. Nothing old..but a lot "new"